The invention relates to compounds oif formula (I), where the variables have tehmeanings given in claim Anspruch I1 angegebenen Bedeutungen haben sowie eine polymerisierbare oder nicht polymerisierbare flüssigkristalline Zusammensetzung, enthaltend eine oder mehrere der erfindungsgemäßen Verbindungen, ein Oligomer oder Polymer, erhältlich durch Oligomerisation oder Polymerisation einer polymerisierbaren, erfindungsgemäßen, flüssigkristallinen Zusammensetzung, ein Verfahren zum Bedrucken oder Beschichten eines Substrats durch Aufbringen einer polymerisierbaren, erfindungsgemäßen, flüssigkristallinen Zusammensetzung auf das Substrat und anschließende Polymerisation, die Verwendung der erfindungsgemäßen flüssigkristallinen Zusammensetzung oder des erfindungsgemäßen Oligomers oder Polymers zur Herstellung optischer oder elektrooptischer Bauteile, ein Verfahren zur Herstellung ausgewählter erfindungsgemäßer Verbindungen, sowie Zwischenprodukte, welche besonders zur Herstellung der ausgewählten erfindungsgemäßen Verbindungen geeignet sind. both hydrogen atoms in the 2,6-naphthyl and the bonded to carbon atoms of hydrogen atoms in the variables Z 1, Z 2, A 1, A 2, Y 3, Y 4, R, T 1 and T 2 is substituted partially or completely by halogen atoms could be. Furthermore, the invention relates to a polymerizable or non-polymerizable liquid crystalline composition comprising one or more of the compounds according to the invention, an oligomer or polymer obtainable by oligomerization or polymerization of a polymerizable inventive liquid-crystalline composition, a process for printing or coating a substrate by applying a polymerizable inventive liquid-crystalline composition to the substrate and subsequent polymerization, the use of the liquid crystalline composition or the oligomer or polymer according to the invention of the invention for the production of optical or electro-optical components, a method for the preparation of selected compounds of the invention, as well as intermediates, which are particularly for the production of the from - selected compounds of the invention are suitable. Numerous compounds go on heating of the crystalline state with defined short-range and long-range order of the molecules is not directly in the liquid, disordered state, but then traverse a liquid crystalline phase in which the molecules are mobile, however, the molecular axes form an ordered structure. Stretched molecules in this case often form nematic liquid crystalline phases, which are characterized by an orientational order of the long molecular axes parallel. 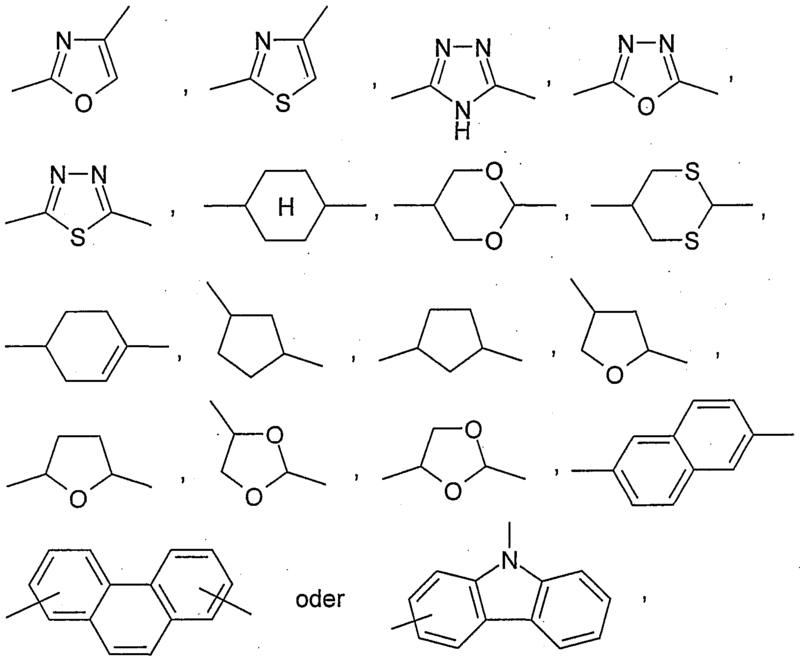 Includes such chiral nematic phase or chiral compounds parts of the molecule, a chiral nematic or cholesteric phase may form, which is characterized by a helical superstructure. Because of their remarkable optical properties, liquid-crystalline materials, especially nematic, chiral nematic or cholesteric materials, including in optical or electro-optical applications of interest. Often, however, the temperature range in which the liquid crystal phase occurs outside the desired application temperature or it extends only over a small temperature range. If you want to fix the liquid crystalline order structures in the solid state, there are various options. In addition to glassy solidification during cooling from the liquid crystalline state, there is the possibility of polymerization in polymeric networks or, for the case that the polymerizable liquid crystalline compounds include bare groups, the polymerization of the liquid crystalline compounds themselves. Furthermore, a very high birefringence of the liquid crystalline materials is often desirable. Under this aspect, especially liquid-crystalline materials which contain 2,6-naphthyl radicals to have a high potential. Polymerizable cholesteric compounds which contain 2,6-naphthyl radicals and reactive glycidyl radicals are, for example, in the publication of MA Espinosa et al, Journal of Polymer Science Part A, Polymer Chemistry, Vol 39, 2847 -.. 2858 (2001), thermally curable nematic and cholesteric diester, 2,6-naphthyl radicals and reactive propargyl end groups, in the publication by HR Kricheldorf and A. Gerken, high performance Polymers 9 (1997) 75-90 and in the publication DE 197 17 371 A1 described. 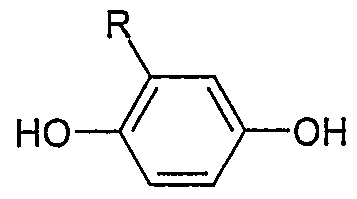 2,6-naphthyl radicals containing non-polymerizable compounds are disclosed in EP 0982621 A2. It is an object of the present invention is to provide further for the production of liquid-crystalline compositions suitable compounds having comparatively high birefringent properties which have a sufficiently large for the processing phase width itself or in the form of such compositions. Accordingly, the compounds of formula I described at the beginning have been found. For the variables Z 1 and Z 2 in formula I are suitable as Ci-C 2tr alkyl whose C 1 - C 2 o-carbon chain may be interrupted by ether oxygen atoms, for example methyl, ethyl, propyl, isopropyl, butyl, isobutyl , sec-butyl, tert-butyl, pentyl, isopentyl, neopentyl, tert-pentyl, hexyl, 2-methyl-pentyl, heptyl, hept-3-yl, octyl, 2-ethylhexyl, isooctyl, nonyl, isononyl, decyl, isodecyl , undecyl, dodecyl, tridecyl, 3,5,5,7-Tetramethylnonyl, isotridecyl (the above designations isooctyl-voltages, isononyl, isodecyl and isotridecyl are trivial names derived from those obtained by the oxo process alcohols - cf. Ullmann's Encyclopedia of Industrial Chemie, 4th edition, Volume 7, pages 215 to 217, and Volume 11, pages 435 and 436), Tetradecyi, pentadecyl, hexadecyl, heptadecyl, octa- decyl, nonadecyl, eicosyl, methoxymethyl, 2-Ethylhexoxymethyl, 2-methoxyethyl, 2-ethoxyethyl, 2-propoxyethyl, 2-lsopropoxyethyl, 2-butoxyethyl, 2- or 3-methoxy-propyl, 2- or 3 -Ethoxypropyl, 2- or 3-propoxypropyl, 2- or 3-butoxypropyl, 2- or 4-methoxybutyl, 2- or 4-ethoxybutyl, 2- or 4-propoxybutyl, 2- or 4-butoxy-butyl, 3,6 -Dioxaheptyl, 3,6- dioxaoctyl, 4.8-dioxanonyl, 3,7-dioxaoctyl, 3,7-dioxanonyl, 4,7-dioxaoctyl, 4,7 dioxanonyl, 4.8-dioxadecyl, 3,6,8 -Trioxadecyl, 3,6,9-trioxaundecyl, 3,6,9,12-Tetraoxatridecyl or 3,6,9, 12-tetraoxatetradecyl; corresponding C 1 -C 20 -alkyl, whose carbon chain by 1 -C 20 sulfur atoms in thioether function, nonadjacent imino, Ci-C 2 o-alkylimino and / or carbonyl groups C, derived formally from the previously listed examples oxygen-containing groups by replacement of the oxygen atoms by sulfur atoms, nonadjacent imino, Ci-C 2 o-alkylimino and / or carbonyl groups derived. wherein all synthesis reactions are understood to be polymers, with polymerization, ie addition as chain reactions, addition polymerization as staged reactions and condensation polymerizations. The variables R 'of the reactive radicals previously exemplified in this case are hydrogen or C 1 -C 4 -A ^ yI, ie, methyl, ethyl, n-propyl, isopropyl, n-butyl, sec-butyl, isobutyl or tert-butyl and may be the same or different. Cyanate compounds can spontaneously to the corresponding cyanurates, trimerize those with cyano, in particular under catalysis of acids such as hydrochloric acid, or bases, to give the corresponding triazines. Compounds having epoxide, thiirane, aziridine, isocyanate and isothiocyanate groups need for the polymerization usually further compounds having complementary reactive groups. For example, isocyanates with alcohols to give urethanes and with amines can polymerize to form urea derivatives. The same applies to thiiranes and aziridines. The complementary reactive groups can either be present in a second compound of the invention which is mixed with the first, or they may be introduced into the polymerization mixture by auxiliary compounds containing two or more of these complementary groups. Containing these compounds in each case two of these reactive groups, linear polymers with predominantly thermoplastic character. If the compounds contain more than two reactive groups, cross-linked polymers, which are mechanically very stable result. 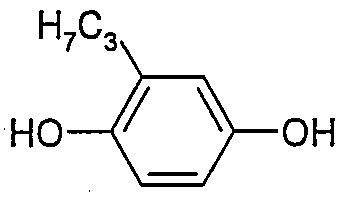 The maleimido group is particularly suitable for free-radical copolymerization with olefinic compounds such as styrene. The aufscheinende in the bridges Y 1 to Y 4 variable R stands for hydrogen addition -C 4 -alkyl, ie, methyl, ethyl, n-propyl, isopropyl, n-butyl, sec-butyl, isobutyl or tert-butyl. Suitable spacers A 1 and A 2 are all known for this purpose groups are considered. The spacers generally contain 1 to 30, preferably 3 to 12 carbon atoms and consist of predominantly linear aliphatic groups. You can in the chain eg imino by nonadjacent oxygen or sulfur atoms or imino or C 4 alkyl, such as methylimino be interrupted. As possible substituents for the spacer fluorine, chlorine, bromine, cyano, methyl and ethyl are contemplated. In particular, bonded to carbon atoms of hydrogen atoms of the spacer chain may be partially or completely substituted by fluorine atoms. The radicals T 1 and T 2 is divalent saturated or unsaturated iso- or heterocyclic radicals. These may consist not only of one but also of several condensed rings together. 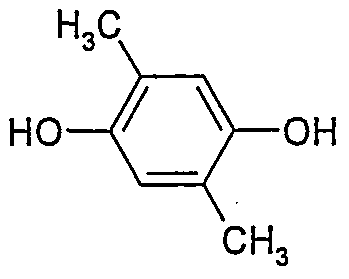 So for example, divalent quinoline, decalin or naphthalene come for T 1 and T 2 into consideration. X 1, X 2 are independently oxygen, sulfur or NL 1 'or NL 2', wherein the bound to carbon atoms of hydrogen atoms may be partially or fully substituted by halogen atoms in the radicals L 1 and / or L2. 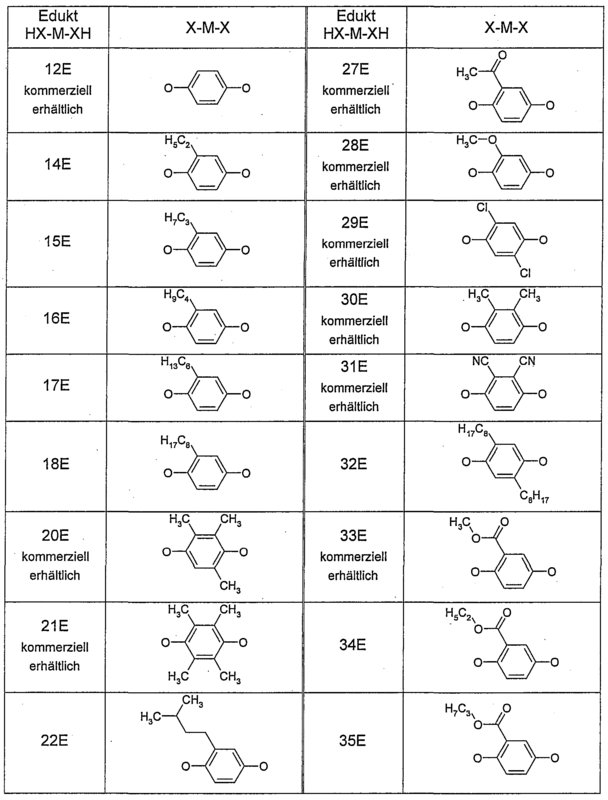 Examples of the variables L 1 and L 1 'in the meaning of a C 2 -C 20 -alkyl keny I, the C 2 -C 2 o-carbon chain by oxygen atoms in ether function, sulfur atoms in thioether function, nonadjacent imino, Ci-C 20 -alkylimino and / or carbonyl groups can be interrupted, and for the variables L 2 and L 2 'in the meaning of a C 2 -C 20 -alkenyl, in particular C 2 -C 20 -AIk-I -enylreste. These radicals can be derived from suitable examples listed above for the variables Z 1 and Z 2 radicals by formal replacement of two hydrogen atoms which are located on adjacent carbon atoms, derived by an additional carbon-carbon bond. Examples of the variables L 1 and L 1 'in the meaning of a C 2 -C 20 -alkynyl, the C 2 - C 20 carbon chain by oxygen atoms in ether function, sulfur atoms in thioether function, nonadjacent imino, dC ^ -alkylimino and / or carbonyl groups can be interrupted, and for the variables L 2 and L 2 'in the meaning of a C 2 -C 20 alkynyl, in particular C 2 -C 20 -AIk-I -inylreste. These radicals can be derived from suitable examples listed above for the variables Z 1 and Z 2 radicals by formal replacement of four hydrogen atoms, which are located on adjacent carbon atoms, derived by two further carbon-carbon bonds. Heteroaryl-C 2 -C 20 -alkenyl and C 2 -C 20 heteroaryl each having 2 to 12 carbon atoms in the heteroaryl are in particular those alkynyl residues which differ from the examples listed above for the variables Z 1 and Z 2 radicals can be derived by formal replacement of a terminal hydrogen atom by C 6 -C 10 -AryI or heteroaryl with 2 to 12 carbon atoms. Come as a C 6 -C 10 aryl, especially phenyl and naphthyl in question for the variables L 1 and L 1 'and L 2 and L 2'. 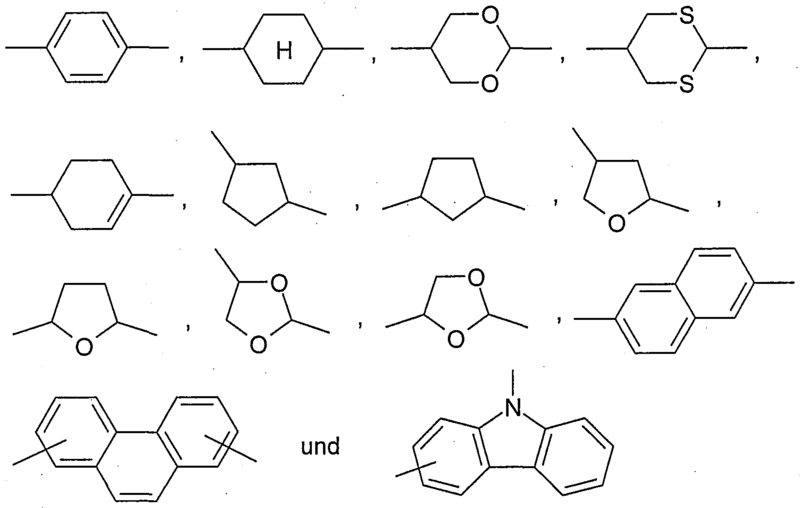 Come of the variables L 1 and L 1 'and L 2 and L 2' heteroaryl having from 2 to 12 carbon atoms such radicals in question, which, for example, pyrrole, furan, thiophene, pyrazole, isoxazole, isothiazole, imidazole, 1H-1 , 2,3-triazole, 1 H-1,2,4-triazole, pyridine, pyrazine, pyridazine, 1H-azepine, 2H-azepine, oxazole, thiazole, 1, 2,3-, 1, 2,4- or 1, 3,4-oxadiazole, 1, 2,3-, 1, 2,4- or 1, 3,4-thiadiazole and optionally the benzo- or dibenzofused rings, such as quinoline, isoquinoline, indole, benzo [b] furan (coumarone), benzo [b] thiophene (thionaphthene), carbazole, dibenzofuran, dibenzo thiophene, 1H-indazole, Indoxazol, benzo [d] isothiazole, anthranil, benzimidazole, benz- oxazole, benzothiazole, cinnoline, phthalazine, quinazoline , quinoxaline or phenazine derived. In the case of the variables L 1 and L 1, the C '6 -C 10 aryl or heteroaryl with 2 to 12 carbon atoms with one or more substituents: halogen, NO 2, NO, CN, CHO, L 2, CO-L 2 , X 2 -CO-L 2, X 2 -SO-L 2, X 2 -SO 2 -L 2, X 2 -L 2 ', CO-X 2 -L 2', O-CO-X 2 -L substituted 2 '2', SO X 2 -L 2 'and SO 2 -X 2 - -. Halogen is fluorine, chlorine, bromine or iodine, in particular fluorine or chlorine. The variables X 1 and X 2 are each independently oxygen, sulfur or NL 1 'or NL 2'. In the radicals L 1 and / or L 2 is bonded to carbon atoms of hydrogen atoms may be partially or fully substituted by halogen atoms. As such, come here chlorine atoms and especially fluorine atoms into account. corresponds, wherein s' values of 0, 1 or 2 and assumes when s'> 0, the variables Y 3 and when s'> 1 the variables T 2 each may be the same or different. wherein G 1 and G 2 represents the groups Z 1 -Y 1 -A 1 -O-COO-, or - (Y 5 -A 2 -) t Y 2 -Z 2 are provided, and in the two 2,6-naphthyl hydrogen atoms may be substituted by halogen atoms such as chlorine atoms or fluorine atoms, in particular, partially or completely. Particularly preferred are compounds of formula I and of the formulas shown above, in which t assumes a value of 1 and Y 5 is a group -O-COO- corresponds. 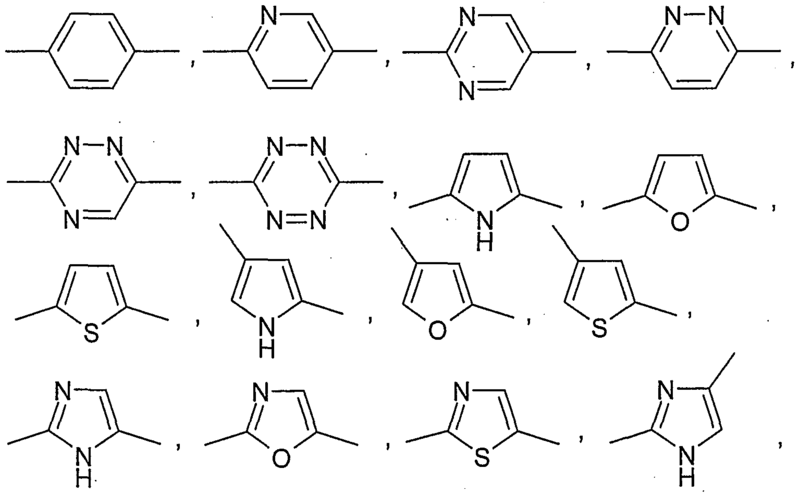 Very particularly preferred polymerizable liquid crystalline compounds as well as their preferred embodiments in which t assumes a value of 1 and the groups Z 1 -Y 1 -A 1, - and -A 2 -Y 2 -Z 2 are the same. and X 1 is oxygen or NL 1 '. 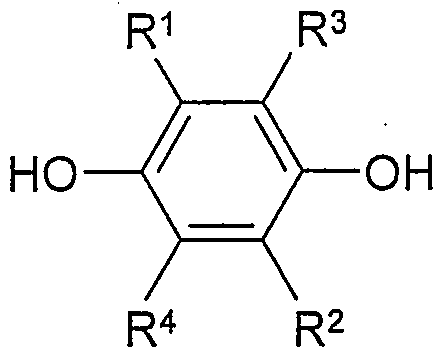 In especially advantageous compounds of formula I 'shown above, the group-pierungen are G 1 and G 2 are identical. In another particularly advantageous compounds of formula I 'shown above, either the two substituents R 1 and R 3 or the two substituents R 4 and R 2 is hydrogen. In another particularly advantageous compounds of formula I 'shown above, at least one of the two substituents R 1 or R 3 is halogen, NO 2, CN, CHO, L 1, CO-L 1, X 1 -CO-L \ X 1 -L 1 'or CO-X 1 -L 1', and the two substituents R 4 and R 2 and optionally one of the substituents R 1 or R 3 denote hydrogen, where L 1 is C 1 -C 20 -alkyl, L 1 'represents hydrogen or C 1 -C 20 -alkyl and X 1 represents oxygen or NL 1 represents'. In another particularly advantageous compounds of formula I 'shown above, at least one of the two substituents R 1 or R 3 L 1, CO-L 1, X 1 -CO-L 1, X 1 -L 1 or CO-X 1 -L 1 'and the two substituents R 4 and R 2 and optionally one of the substituents R 1 or R 3 denote hydrogen, where L 1 is C 20 alkyl, L 1' is hydrogen or C r C 20 alkyl and X 1 represents oxygen or NL 1 '. In another particularly advantageous compounds of the formula shown above significance tet at least one of the two substituents R 1 or R 3 L 1, X 1 -L 1 or CO-X 1 -L 1 and the two substituents R 4 and R 2 and optionally a the substituents R 1 or R 3 denote hydrogen, where L 1 is C 2 o-alkyl and X 1 is C r for oxygen. the present invention further provides a polymerizable or non-polymerizable liquid crystalline composition comprising as components 10 to 100 wt .-% of compounds of the formula I or their preferred embodiments of the invention, 0 to 90 wt .-% of further monomers, 0 by weight to 50th -% of one or more chiral compounds, and up ü wt .-% further additives including 0, the sum of the proportions of the components adding up to 100 wt .-%. A polymerizable or not polymerizable inventive liquid-crystalline composition is in general not only such a composition to understand which one or more components have been per se liquid crystal (in the temperature range of interest) properties, but also such a composition is hereunder to understand that only (eg lyotropic systems) which by mixing the ingredients or else only by admixing the compounds of the invention liquid crystalline behavior. Furthermore, the compounds of the formula I and their preferred embodiments may already have even liquid crystalline behavior, necessarily but they do not have this property. Mixing of suitable commercially available liquid crystalline materials, such as for active LC layers in display technology, they are used, prepared with one or more of the compounds of formula I or their preferred embodiments of the invention. If it is the latter fertilize to connects, which contain one or two reactive radicals Z 1 and Z 2, so these are present in the inventive compositions at a concentration such that they do not to generate correspondingly densely crosslinked self-supporting polymerization or condensation products sufficiently is. 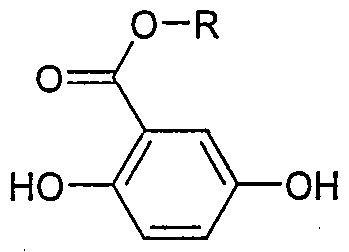 A polymerizable composition according to the invention is in particular a composition in which at least one of the components is capable under the usual polymerization conditions for the formation of polymerization or condensation products and, as such, which is polymerizable, and can be polymerized into self-supporting products or condensed. Depending on the number of reactive radicals in the components of the polymerizable liquid crystalline composition, the desired polymerization, crosslinking and / or degree of condensation can be adjusted after polymerization or condensation. This composition can be easily prepared by mixing suitable materials with one or more of the compounds prepared according to the invention, these materials itself polymerizable or not polymerizable, liquid-crystalline or may not be liquid crystalline. Suitable polymerizable bare, liquid crystalline materials are compounds containing, for example in the WO documents 95/22586 A1, 95/24454 A1, 95/24455 A1, 96/04351 A1, 96/24647 A1, A2 97/00600, 97/34862 A1 and 98/47979 A1, and the publications EP 1134270 A1 and DE 198 35 730 A1 describes and substantially corresponding to the schematic structure PYAYMYAYP, wherein the variables P, Y and A are defined analogously to the variables Z 1 and Z 2, Y 1 to Y 5 have and a 1 and a 2 in formula I, and M denotes a mesogen unit. The reactive compounds, which are listed in the document DE 100 25 782 A1 as a component B) of the liquid crystalline compositions of matter described therein, the liquid crystalline composition of the invention may be incorporated as further monomers. These usually cost compounds exhibit no liquid crystalline behavior itself is usually, but their addition opens the possibility to reduce the amount of costly components in the composition without the liquid crystalline behavior significantly influenced. In addition, can be personalized with the help of reactive monomers targeted properties of the composition, adjust as degree of crosslinking, viscosity, elasticity, etc.. The selection of suitable reactive monomers is easily accomplished by the skilled person, optionally after carrying out preliminary experiments. It should be noted that such reactive compounds may act in the compounds discussed above sense as (auxiliary) here. Depending on the intended use of the liquid crystalline composition of the invention it may also contain at least one chiral compound. By adding them to obtain a chiral nematic or cholesteric liquid-crystalline composition which special optical properties, such as dependent on the viewing angle color effects, reflection in the IR or UV-wavelength range of the spectral range, etc., have. Other chiral compounds containing the above as well as other suitable chiral radicals X are called 198 43 724 A1, for example, in the documents EP 0747382 A1, EP 0750029 A1, EP 1136478 A1 and DE. The liquid crystal composition may contain other additives. As such, thermal curing or radiation-curing auxiliaries, substrate wetting auxiliaries, wetting agents and dispersants are suitable photoinitiators, diluents, thickeners, antifoams and deaerators, lubricant and leveling agents, yaw aids, hydrophobicizing agents, coupling agents and auxiliaries for improving the scratch resistance, dyes and pigments and additives selected from the group consisting of light, heat and / or oxidation stabilizers. In the chemical-physical nature of these additives is extensively discussed in WO 00/47694 A1. the present invention further provides for an oligomer or polymer obtainable by oligomerization or polymerization of a polymerizable liquid crystalline composition of the invention. This oligomer or polymer according to the invention can in particular also in the form of a film, ie a self-supporting layer of uniform thickness are present. This film may be located on a substrate which is arranged so that appropriate measures can be a slight separation and transfer to another substrate for permanent. Such a film is useful for example in the region of the film coating and laminating. Moreover, such films, using the appropriate use angepasst- in different areas -in their properties. For example, they can be found in devices for displaying visual information using. Such devices are as video or overhead projectors, electrophoretic retical display devices, traffic displays, LCDs for use in computer monitors, televisions, VDUs in printers or kitchen appliances and advertising panels, illuminations and signboards further mobile screens, such as display units in cellphones, laptops, digital cameras, vehicles and destination displays on buses and trains. They can be included in these devices in verschiedenster function, for example as color filters or films for the production of wavelength-selective or broad band polarized light. The present invention further provides a process for printing or coating a substrate, which is characterized in that applying a polymerizable liquid crystalline composition of the invention onto the substrate and subsequently polymerized. With regard to the method for printing or coating substrates with liquid crystalline materials, reference is made mutatis mutandis to the document WO 96/02597 A2. Moreover is also produced by the process according to the invention, and to understand the original substrate surface is partly or completely covering polymerized layer as a substrate for the purposes of registration, so that the present invention also includes the production of multiple printed and / or coated substrates. It should be noted on here, that "printing" is usually the incomplete coverage of the substrate surface, the complete coverage of the substrate surface is meant by "coating". As substrates in addition to paper and card, such as tote bags, magazines, brochures, gift packaging and packaging materials for utility, pleasure and luxury goods, including films, such as for decorative and non-decorative packaging purposes, and textiles of any kind and leather in question , Furthermore come such as substrates for the production of banknotes, securities, tickets, among other things used materials into consideration. Further substrates are also (consumer) electronics such as music cassettes (MCs), SVHS and VHS cassettes, mini discs (MDs), compact discs (CDs), digital versatile discs (DVDs) and the corresponding playback and / or recording equipment, televisions, radios, telephones / cell phones, computer equipment, etc., and goods from the leisure, sports, domestic and games sector, such as bicycles, children's vehicles, skis, snowboards and surfboards, inline skaters and roller and ice skates and household appliances. In addition, to be understood by such substrates for example, writing utensils and spectacle frames. Further substrates are also a wide variety of films which find use in optical or electro-optical components or in their manufacture. Such films consist for example of polyvinyl alcohol (PVA), triacetyl cellulose (TAC), polyimide (PI), polyvinyl (PVC) or polyolefins, such as polynorbornene, and may for example (broadband) polarizers, light-conducting elements for the backlight in LCDs (so-called " light guides "), sheets for the distribution of light (so-called" BEFs, "ie," brightness enhancement films ") and sheets for the production of polarized light in LCDs (so-called" DBEFs "ie" dual brightness enhancement films ") may be. Further substrates in this context may also be certain modules of the LCDs, such as glass or polymer wafers, which may further comprise a transparent conductive coating, for example of indium-tin-oxide (ITO) have. 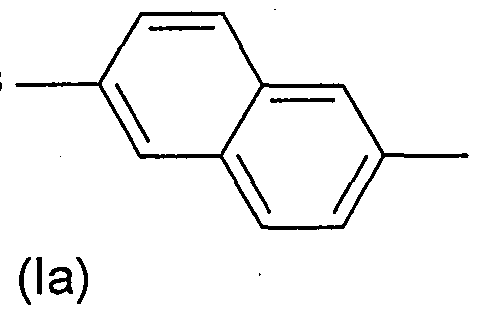 Light guides or BEFs can for example directly with the inventive nematic (ie, the proportion of the chiral compound (s) is 0 wt .-%) or chiral nematic composition coated and these are then polymerized Siert. The coating operation may in this case more or less often be repeated with compositions of this invention the same or different composition of to generate corresponding optical components, such as retardation films (so-called "retardation film") (broadband) polarizers and optical filters. This makes it possible to produce a suitably compact structure of the optical components in LCDs. Next a suitable nematic layer can be used as a retardation film on, circularly polarized light delivered (broadband) polarizer are applied by the inventive process. In this way can be converted into linearly polarized circularly polarized light. The (broadband) polarizer may hereby also made of compositions of this invention optionally with the use of the method according to the invention, may have been manufactured. Further substrates are encountered in the construction sector surfaces such as building walls or windows. In the latter case next to a decorative, a functional effect may be desired. So it is possible to create multiple layers on the window material whose individual layers have different chemical and physical properties. 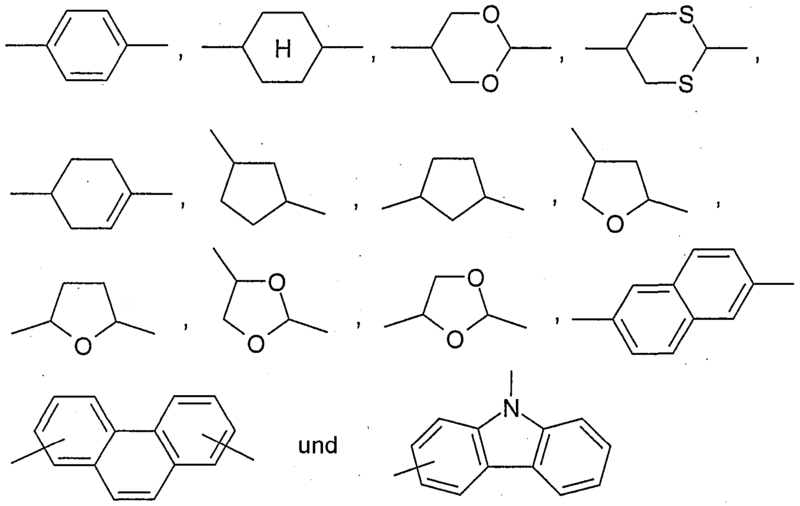 If, for example with addition of one enantiomer of a chiral compound as well as of the corresponding optical antipodes individual layers of the polymerized liquid-crystalline composition having opposite twist or individual, with the addition of different concentrations of chiral compound layers of polymerized liquid crystal composition same rotation direction but each of different pitch and thus different reflection properties applied so targeted at specific wavelengths or wavelength ranges of the light spectrum can be reflected. In this way, an IR or UV reflective coating window is for example possible. Accordingly, another object of the voliegenden invention is tung the use of the liquid crystalline composition or the oligomers or polymers according to the invention according to the invention for preparing a Wärmeisolationsbeschich-, comprising one or more cholesteric layers which, in the infrared wavelength region, preferably above 750 nm, in particular in the wavelength range of 751 nm to about 2000 nm is reflected at least 40%, especially at least 45% of the incident radiation. In particular, another object of the present invention, processing using the liquid crystalline composition or the oligomers or polymers according to the invention according to the invention for preparing a Wärmeisolationsbeschich-, comprising one or more cholesteric layers which, in the infrared wavelength range, vorzusweise above 750 nm, in particular in the wavelength range of 751 nm to about 2000 nm is at least 40%, especially at least 45% of the incident radiation reflected and having a transmission of at least 80%, especially at least 90% of the incident radiation in the wavelength range from about 390 nm to 750 nm. the present invention further provides a Wärmeisolationsbeschich- tung, comprising one or more cholesteric layers reflecting in the infrared wavelength range, preferably above 750 nm, in particular in the wavelength range of 751 nm to about 2000 nm is at least 40%, especially at least 45% of the incident radiation and which is obtainable by using the liquid crystalline composition or the inventive oligomers or polymers according to the invention. In particular, another object of the present invention tion coating a Wärmeisola-, comprising one or more cholesteric layers which, in the infrared wavelength region, preferably above 750 nm, in particular in the wavelength range of 751 nm to about 2000 nm is at least 40%, especially at least 45% of the incident radiation reflected and to 750 nm in the wavelength range of about 390 nm has a transmission of at least 80%, especially at least 90% of the incident radiation, and which is obtainable by using the liquid crystalline composition or the inventive oligomers or polymers according to the invention. On this aspect of flüssigkristal-linen composition of the invention, especially in terms of thermal insulation coatings is accordingly also referred to the document WO 99/19267 A1. The present invention further relates to the use of the liquid crystalline composition or the inventive oligomers or polymers according to the invention for manufacturing optical components. As such, for example LCDs and the components thereof, may be mentioned, for example, (broadband) polarizers, optical filters, retardation films (so-called "retardation film") and BEFs. With regard to the production of such components based on polymerizable liquid crystalline materials, accordingly referred as to the document WO 00/37585 A1. With regard to the use of inventive polymerizable chiral nematic compositions for the preparation of (broadband) polarizers US 6,417,902, US 6,061, 108, US 6,099,758, US US 5,948,831, US is made mutatis mutandis, for example, to the documents US 6,421, 107, 6,016,177, 5,793,456 , US 5,691, 789 and US 5,506,704 referenced. With regard to the use of inventive polymerizable nematic compositions for producing DBEFs US 5,828,488 and US 5,965,247 is made mutatis mutandis, for example, to the documents US 4,525,413, directed. The latter two references describe laminates of polymer layers, which are arranged in their optical properties such that a layer S 1 isotropic or anisotropic, the adjacent layer, however, 2 S 1 of S anisotropic optical behavior differing points either. The refractive index n 1 in a plane direction of S 1 corresponds in value substantially corresponds to the refractive index n 2 in the same plane direction of S 2, the refractive indices n 2 1 and n 2 2 in the direction perpendicular to each plane direction of S 1 or . S 2, however, differ. Light beams which are incident on these laminates therefore, depending on its direction of polarization either transmitted (when n ^ and n 2 are substantially equal) or reflected (when n is 2 and n 2 1 2 are different from each other). Therefore, the anisotropic layers S 2 may, in alternation with layers of polymers having suitable isotropic or anisotropic refractive index, from corresponding, by polymerization of the polymerizable nematic compositions according to the invention obtained polymers or oligomers are made. As the polymer layers S 1, for example, adhesives are suitable that the anisotropic layers S 2 with one another glue, or plastic films having a suitable glass transition temperature which form at an appropriate temperature treatment together with the layers S 2 the desired laminate. Moreover, one can a polymer layer S 1 with an inventive polymerizable nematic composition coat, S apply a further polymer layer 1 and then polymerize the composition between the two polymer layers S 1 located. Irrespective of the chosen procedure for the preparation of such laminates, of course, a sufficiently good adhesion of the layers S 1 and S 2 must be ensured to each other. but the liquid crystalline composition of the invention can also be used as the dispersed liquid crystalline phase in so-called "polymer dispersed liquid crystals" ( "PDLC"). Such PDLCs can in principle have either an isotropic polymer matrix and both macroscopically isotropic and anisotropic disperse liquid crystalline phase or an anisotropic polymer matrix and both macroscopically isotropic and anisotropic disperse liquid crystalline phase, wherein said macroscopically-isotropic phase from the statistical distribution of microscopic anisotropic domains results. In general, such PDLCs by a (optically anisotropic usually) polymeric film is considered for the preparation, in which the liquid crystalline phase is in the form of fine inclusions, typically in the micrometer or submicrometer size range uniformly dispersed. both the polymer matrix and the dispersed phase, anisotropic optical behavior is imposed by stretching the polymer film. Find inventive polymerizable liquid crystalline compositions of use, then the anisotropic state of the dispersed phase can be frozen by polymerization and thus achieve, for example, a significantly better temperature (change) resistance. As a polymer matrix in this case is usually polyvinyl alcohol use. 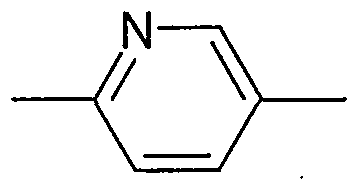 Furthermore, the polymerizable chiral nematic composition of the invention for example for the production of optical components can be used, as described in the documents US 5,235,443 and US 5,050,966. The liquid crystalline composition of the invention may further also be used as liquid-crystalline colorant or for the production of liquid-crystalline colorant. The use as colorants is possible if the composition per se is already colored. This color may be based on interference effects of this chiral nematic phase and / or absorption effects contained dyes and / or pigments. Furthermore, the composition, irrespective of whether it is colored or not serve for the production of colorants. With regard to the production of liquid-crystalline coloring agents and their use for printing or coating substrates, reference is made mutatis mutandis to the document WO 96/02597 A2. The inventive composition may additionally in the production of dispersions and emulsions, which are preferably based on water, are used. For making such dispersions and emulsions using liquid-crystalline materials is here to WO documents 96/02597 A2 and directed 98/47979 A1. These dispersions and emulsions can also be used for printing and coating substrates such as those exemplified previously described, can be used. Further, the composition according to the invention may also find use in the production of pigments. The preparation of such pigments is known and for example in detail in WO 99/11733 A1 described. But beyond preset pigments can also be in shape and size by using printing techniques or with the help of networks, the polymerizable composition is in the interstices hersteilen. The subsequent polymerization or condensation of the liquid crystal composition in this case is followed by the removal or leaching from the substrate or from the network. These procedures are described in WO 96/02597 fonts AI 1 97/27251 A1, 97/27252 A1 and EP 931 110 A1 describes in detail 0. These pigments may be single or may have a multilayer structure. The latter pigments are typically only produced when coating methods are used, in which successively produces a plurality of layers one above the other and are finally subjected to a mechanical comminution. For the previously described use of the liquid crystalline composition of the invention as a liquid-crystalline colorant or for the production of liquid-crystalline coloring agents, in the preparation of dispersions and emulsions as well as in the manufacture of pigments, use is preferably made of a polymerizable composition. optionally 'converts, wherein W and W' in the presence of one or more auxiliary compounds, to unsymmetrical compound of formula Ib for the same or different from each other, leaving in the reaction leaving groups or identical or different precursor groups are provided, which with the one or more optionally present auxiliary compounds can be converted into a leaving leaving group. 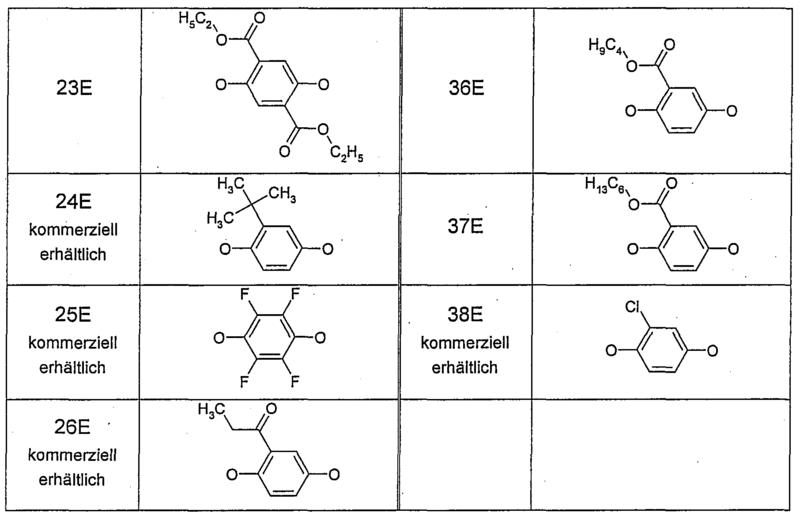 With regard to different methods of Estersynthese and the corresponding synthesis conditions which are suitable for the present process, reference is made to the relevant and known to the expert literature, such as Ullmann's Encyclopedia of Industrial Chemistry, John Wiley and Sons or Advanced Organic Chemistry, MB Smith referenced 499 - and J. Maren, 5 th Edition, Wiley-Interscience, New York, p 485 interface. For W and W all occur to those skilled known as such groups in question. In particular, here for W and W may be mentioned hydroxyl, halogen, such as fluorine, bromine and especially chlorine, and C 1 -C 4 -alkoxy, such as methoxy, ethoxy, n-propoxy, isopropoxy, n-butoxy, sec-butoxy , isobutoxy or tert-butoxy. 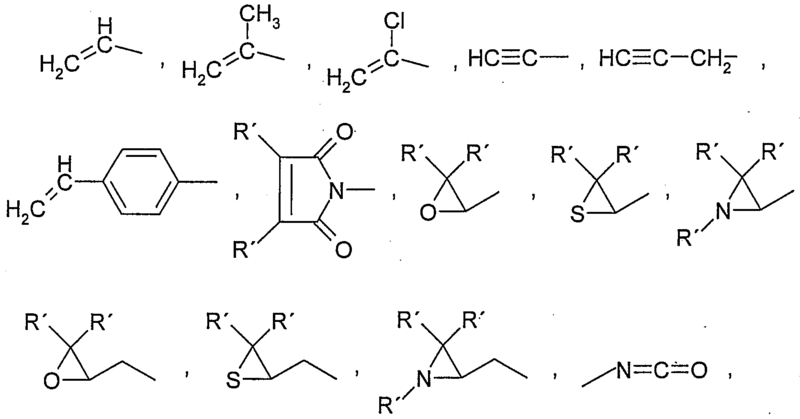 Also useful for W and W radicals of inorganic acids such as hydrogen sulfate, sulfate, dihydrogen phosphate, hydrogen phosphate or phosphate residues of organic acids such as formate, acetate, trifluoroacetate, as well as residues of aliphatic or aromatic sulfonic acids or partially or fully fluorinated aliphatic or aromatic sulfonic acids. 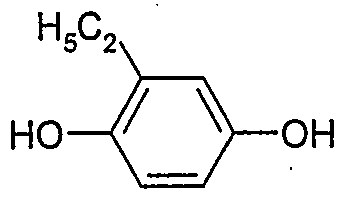 Examples of such aliphatic or aromatic sulfonic acid are about see H 3 C-SO 2 -O, F 3 C-SO 2 -O, F 3 C-CH 2 -SO 2 -O, F 9 C 4 -SO 2 -O . In the compounds of formulas IIIa 'and IIIb' are then to the corresponding mixed anhydrides. Suitable auxiliary compounds as dilute or concentrated inorganic acids, such as sulfuric acid, phosphoric acid or hydrochloric acid, dilute or concentrated organic acids, such as formic acid, acetic acid, trifluoroacetic acid, dilute or concentrated aliphatic or aromatic sulfonic acids, dilute or concentrated, partially fluorinated aliphatic or aromatic sulfonic acids or dilute or concentrated, completely fluorinated aliphatic or aromatic sulfonic acids are used. The acids listed above are used as auxiliary connections particular use when it is W and W is hydroxy or C r to C 4 alkoxy. transferred. The corresponding intermediate compounds are usually not isolated or they often can not be isolated because they react rapidly with the other reactants in the reaction mixture. In the event that it is hydroxy at W and W, more Hilfsverbin- compounds are also dialkylazodicarboxylates in combination with triarylphosphine, such as diethyl azodicarboxylate / triphenylphosphine, N, N'-carbonyldiimidazole, aliphatic or aromatic sulfonic acid chlorides in combination with a tertiary amine such as Methansulfonsäurechiorid / triethylamine, chlorosilanes, tetra- phosphordecaoxid or ion exchangers, such as Amberlyst ® -15 (commercially available from Rohm & Haas). Are used as compounds of the formulas IIIa 'and IIIb' the aforementioned mixed anhydrides so formed in the reaction with compound II 'corresponding to the above-mentioned compounds as the auxiliary acids. transferred. The corresponding intermediate compounds are usually also not isolated or they often can not be isolated because they react rapidly with the other reactants in the reaction mixture. wherein XMX or XMZ 2 has the meaning given in the following Table A1. It should be additionally noted here that due to manufacturing both in the compound ABC-CI and in the grouping of the intermediate ABC NAPS a part of the acrylate groups in the form of its HCl adduct is present. In the final step of the synthesis of the above scheme A, however, the elimination of HCl with reformation of the acrylate (see also Example 6a. See page 66 of WO 98/47979 A1) takes place again. In the grouping ABC ( "acryloyloxy-butyl chloroformate") corresponds to the vinyl group of Acrylatrestes the variables Z 1, the carboxyl group of the variables Y 1 and the n-butylene radical - (CH 2 ^ - of the variables A 1 according to the terminology of the aforementioned formula Ia '. 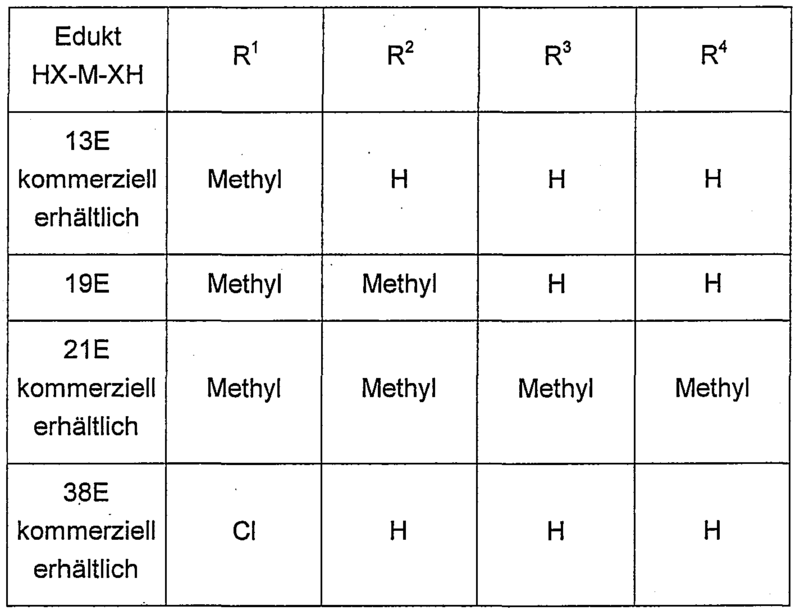 the meaning of the variables X and M or the grouping XMX in the synthesized compounds are listed in the following table. 65.2 g (168 mmol) and in the case of compound 10 32.6 g (84 mmol) and a small amount NAPS Kerobit ® BHT (0.14 g) were placed in 350 ml of oxalyl chloride and slowly (with 5 drops of dimethylformamide DMF) was added. The reaction mixture was then stirred for one hour at room temperature Tempe, the excess oxalyl chloride was then removed in vacuo and the residue is dried under high vacuum. 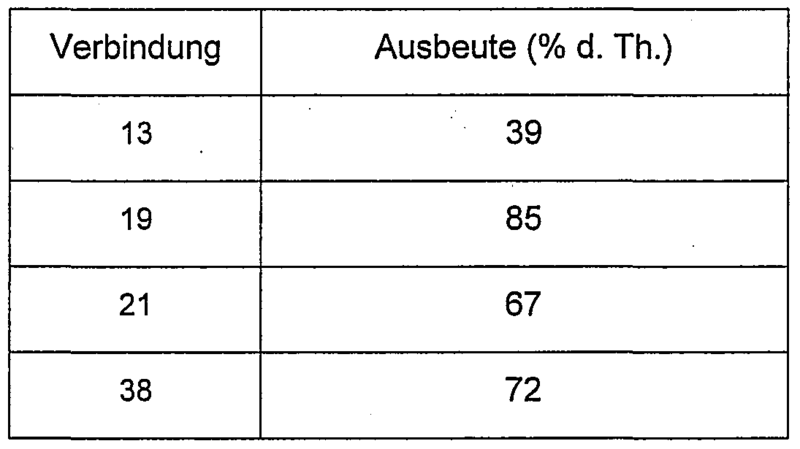 The yellowish gum-like product was dissolved in 100 ml CH 2 CI 2 at -10 0 C under nitrogen purge trop-fenweise a solution of 70 mmol of the respective compound HX-M-XH (Table A1; educts 1E to 3E and 6E to 9E ) and 70 mmol of the compound HX-MZ 2 (Table A1; educt 10 e), 0.03 g Kerobit ® BHT and 53.4 g (420 mmol) N 1 N- dimethylcyclohexylamine in 200 ml CH 2 CI 2 and followed by stirring the reaction mixture obtained first for 12 hours at room temperature and then 5 h at 45 0 C. Thereafter, 200 ml of distilled water and 15.2 g of concentrated aqueous hydrochloric acid were added and the phases separated. The organic phase was washed twice with 200 ml of saturated aqueous common salt solution, dried over anhydrous sodium sulfate and concentrated in vacuo. The obtained residue (usually a brown oil) could typically by grinding or suspension in methanol or ethanol, purified by column chromatography (on SiO 2, usually as eluent: toluene / acetone 10: 1), by precipitation from a solution in CH clean 2 CI 2 by means of n-hexane or methanol or a combination of these steps. the respective product was obtained as a white to off-white powder. 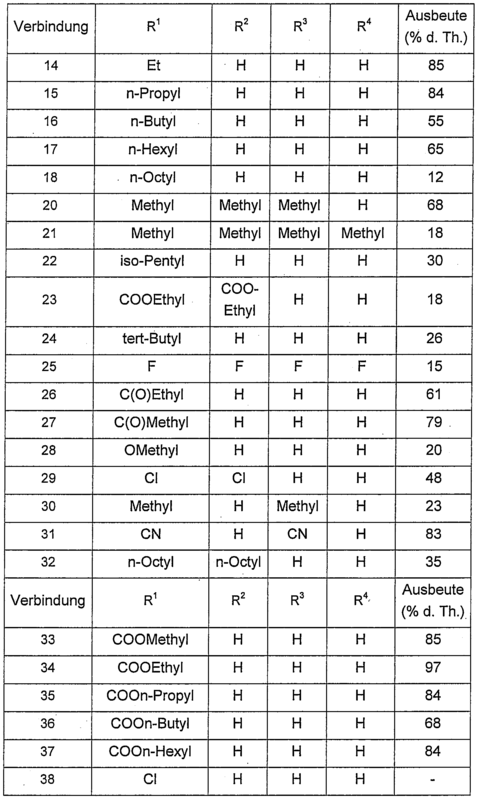 Yield and cleaning of each compound are shown in the above table A1. 16.0 g (250.9 mmol) of potassium hydroxide were added to 350 ml of triethylene glycol and the resulting suspension heated to 80 0 C. Were then added 10 g (60.2 mmol) of 2,5-dihydroxypropiophenone and 10 g (199.2 mmol) of hydrazine hydrate and the solution was heated 2 h under reflux (about 140 0 C). After the volatiles 140-195 0 C had been distilled off, the mixture was 4 h maintained at 195 0 C. Then were added 400 ml of water, adjusted to pH with concentrated hydrochloric acid to approximately 2 to 3, and the aqueous phase was extracted three times with 200 ml tert-butyl methyl ether. The organic phases were combined, dried over anhydrous magnesium sulfate and concentrated in vacuo. The resulting oil was dissolved in CH 2 Cl 2 and was added slowly to n-hexane to precipitate the product. After filtration (69% of theory 41, 2 mmol,) of the desired product 15E was obtained 6.4 g as a gray solid. A mixture of 0.05 mol cyclohexane-1, 4-dione, 0.05 mol aldehyde RCHO and 0.05 mol of lithium chloride in 100 ml of pyridine was 4 h at 115 0 C heated. The majority of the pyridine was distilled off in-closing, the residue poured into 200 ml water and the pH adjusted to 2 with concentrated hydrochloric acid. The resulting solution was extracted twice with 200 ml of diethyl ether, dry the combined organic phases over water-free sodium sulfate and then aufkonzen-trated under reduced pressure. The brown oily residue was stirred overnight with n-hexane and the resulting solid filtered off. the corresponding crude products were obtained as a brownish powder and used them without further purification for the subsequent reactions. A mixture of 15 g (97.3 mmol) of 2,5-dihydroxybenzoic acid and 4 ml of concentrated sulfuric acid in 300 ml of alcohol (ethanol for 34E and n-propanol for 35E) was heated under reflux. After 24 hours of reaction time was added, 2 ml of concentrated sulfuric acid and the mixture was kept for a further 24 hours under reflux. After cooling to room temperature, were 300 ml of water to the reaction mixture and the product was obtained as oil. After further stirring (usually after about one hour), the product crystallized out and was obtained as a white powder after filtration. Sodium bicarbonate in 30 ml DMF was stirred for 1 h at 70 0 C under nitrogen. 20 mmol of the appropriate bromoalkane R-Br were added and the suspension for a further 7 h at 70 0 C. The reaction mixture was poured into 100 ml of water and the resulting aqueous phase with 60 ml of a 1: 1 mixture of n-hexane and ethyl acetate. The organic phase is washed three times with 50 ml of water, were 3 g of Al 2 O 3 (3 g) and filtered. The mother liquor was concentrated under reduced pressure and the corresponding product was obtained as a white to off-white solid. 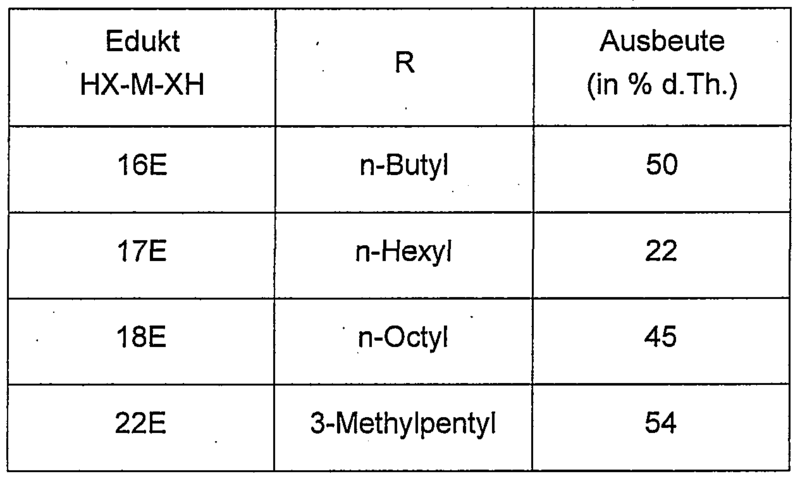 The yields obtained for the respective compounds according to synthesis instructions A and B are listed in the foregoing Table A5. A solution of 2.0 g (10.0 mmol) of 2,5-dihydroxyterephthalic acid and 2 ml of concentrated sulfuric acid in 25 ml (0.42 mol) of ethanol was stirred under reflux for 24 h. Subsequently, the reaction mixture was cooled to room temperature and the pH with a 5 percent aqueous sodium bicarbonate solution adjusted to 6 (it were required about 80 ml of the solution), whereupon a solid precipitated. This was filtered off, dissolved in ethyl acetate and the resulting organic phase was washed twice with 100 ml water and twice with 100 ml of 5 percent aqueous sodium bicarbonate solution, dried over anhydrous sodium sulfate and concentrated in vacuo. 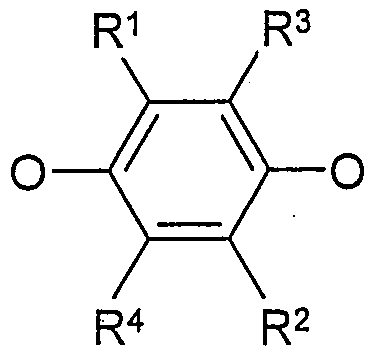 a brownish residue, which consisted mainly of the compound 23E and was used without further purification for the subsequent reactions were obtained. A suspension of 75.7 g (0.435 mol) of sodium dithionite in 150 ml of water was slowly added to a solution of 5.0 g of 2,5-dimethyl-p-benzoquinone in 150 ml of diethyl ether. The reaction mixture was stirred vigorously for one hour, where the color changed from yellow to colorless. Subsequently, 200 ml of water were added was dissolved until all of the solids and stirred for an additional hour. The phases were separated and the aqueous phase extracted twice with 100 ml of diethyl ether. The combined organic phases were washed with 100 ml of water and 100 ml concentrated sodium chloride solution, dried over anhydrous magnesium sulfate and concentrated under reduced pressure. The solid residue was suspended in 100 ml CH 2 CI 2, the suspension stirred for one hour and then filtered off the solid. 5.1 g of the desired compound 19E in nearly quantitative yield was obtained as a white powder. and 4 drops of concentrated sulfuric acid in 40 ml of toluene was under azeotropic distillation conditions (Dean-Stark) for 3 h heated to reflux. After cooling to room temperature, was added 100 ml of methanol and the resulting solution filtered. The filter cake was washed several times with methanol and then dried. the corresponding compound as a light brownish colored solid. 22.1 mmol of 4-acryloyloxybutyl chloroformate were added dropwise at 0 0 C to a solution of 6.3 mmol of the appropriate prepared under B) dihydroxy compound and 18.9 mmol N, N-dimethylcyclohexylamine in 20 ml DMF and the mixture stirred for 12 h at room temperature. Then, another 6.3 mmol of N 1 N- dimethylcyclohexylamine an additional hour at 40 0 C were added and the reaction mixture stirred. The reaction mixture was poured onto 300 ml of water and the pH adjusted to 5 with concentrated hydrochloric acid. After two hours of stirring, the suspension was filtered, the filter cake with water gewa-rule and dried. After purification by column chromatography (SiO 2, toluene / ethyl acetate 20: 1) to give the corresponding compounds as white solids in amounts indicated in the table yields. Variable Y 5th The variable r in formula I assumes the value 0 and the variables Y 3 and T 2 in the grouping (Y 3 -T 2 -) s is are defined as a -CO-O- or 1, 4- phenylene group wherein the variable s has a value of Figure 1. 10 g (0.048 mol) of 4-acryloyloxybutyl chloroformate were added at 0 ° C dropwise to a solution of 5.6 g (0.02 mol) NPPh, 7.6 g (0.06 mol) of N, N-dimethylcyclohexylamine and 0.03 g of 4-hydroxy-2,2,6,6-tetramethylpiperidine-1-oxyl (4-hydroxy-TEMPO) in 40 ml DMF. The reaction mixture was stirred an additional hour at 0 0 C and then for 4 h at 40 0 C. After allowing 150 ml of water was added, a pH value of 4 to 5 was adjusted with dilute hydrochloric acid and extracted the resulting aqueous layer with 400 ml CH 2 CI. 2 The organic phase was washed twice with 250 ml of water and 200 ml of a saturated saline solution, dried over anhydrous sodium sulfate and concentrated under reduced pressure. The resulting yellow powder was suspended in 50 ml of methanol and then filtered off. 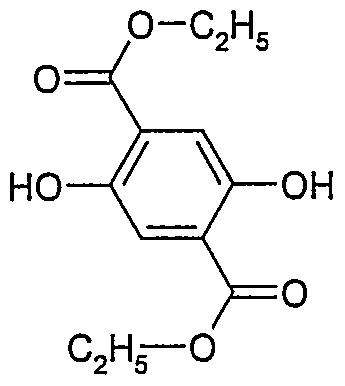 7.7 g (62% of theory) of the desired compound 5 as a white powder. In comparison between the general formula I and the formula of Compound 11, the vinyl groups of the acrylate correspond to the variables Z 1 and Z 2, the carboxyl groups of the acrylate to the variables Y 1 and Y 2, the n-butylene radicals - (CH 2 J 4 -. the variables A 1 and A 2 and the right-hand carbonate corresponds to the variable Y 5 the variable r in formula I assumes the value 0 and the variables Y 3 and T 2 in the group- (Y 3 -T 2 -) pierung s comes to the meanings of a -CO-O- or 2,6-naphthylene group, wherein the variable s has a value of Figure 1. A mixture of 9.41 g (0.05 mol) of 6-hydroxy-2-naphthoic acid, 24.03 g (0.15 mol) of 2,6-dihydroxynaphthalene, 0.8 g of p-toluenesulfonic acid monohydrate and 3 drops of concentrated sulfuric acid in 100 ml of toluene was 12 hours with occasional addition of concentrated sulfuric acid (3 drops every 3 h) heated under reflux. The resulting suspension was cooled to room temperature and filtered. The filter cake was suspended in methanol, the suspension is stirred for 3 h and then filtered off the solid. 10.9 g were obtained 6-hydroxy-2-naphthoic-6 hydroxynaphthylester ( "NPNP") as a tan solid which was processed in the following step without further purification. 10 g (0.048 mol) of 4-acryloyloxybutyl chloroformate were added at 0 0 C was added dropwise to a solution of 6.6 g (20 mmol) NPNP, 7.6 g (0.06 mol) of N, N-dimethylcyclohexylamine and 0.03 g of 4 hydroxy-TEMPO in 40 ml of DMF. After the reaction mixture was stirred for another hour at this temperature, it was allowed to slowly warm to room temperature. After four hours of heating at 40 0 C. 150 ml water were added and the pH adjusted to 4 to 5 with concentrated hydrochloric acid. After the obtained mixture was decanted and the remaining viscous paste was stirred overnight with 50 ml of methanol gave a brown solid which was purified by column chromatography (SiO 2, toluene / acetone 10: 1) was purified. 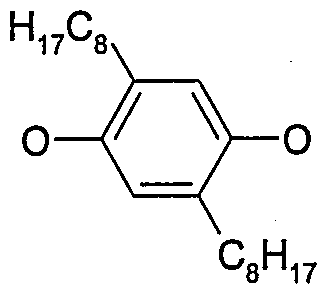 7.7 g (62% of theory) of the desired compound 11 as a white solid. In comparison between the general formula I and of the formula of compound 4, the vinyl groups of the acrylate correspond to the variables Z 1 and Z 2, the carboxyl groups of the acrylate to the variables Y 1 and Y 2, the n-butylene radicals - (CH 2) 4 - the variables A 1 and A 2 and the right-hand carbonate corresponds to the variable Y. 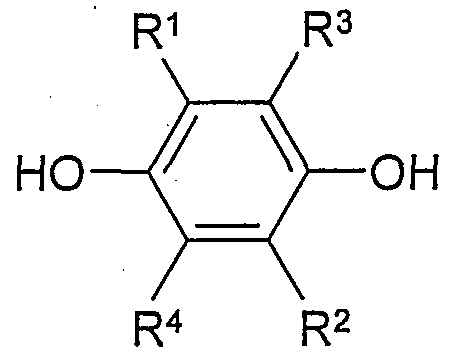 5 The variables T 1 and Y 4 in the moiety (-T 1 - Y 4) r are defined as a 1, 4- phenylene or -CO-O- group to join, wherein the variable r takes a value of 1; the variables Y 3 and T 2 in the grouping (Y 3 -T 2 -) s to come are defined as a -CO-O- or 1, 4-phenylene group, where the variable s takes a value of the second A mixture of 8.2 g (25 mmol) of 4- (4-Acryloyloxybutoxycarbonyloxy) benzoic acid (synthesized analogously to the on page 33 in the publication WO 97/00600 A2 under Bb) disclosed procedures), 5 drops of DMF and a catalytic amount of 4 - hydroxy-TEMPO in 60 ml of oxalyl chloride was stirred for 1 h at room temperature. The excess oxalyl chloride was then distilled off under reduced pressure and the residue dried under high vacuum. The solid obtained was dissolved in 30 ml CH 2 Cl 2 and slowly added to a solution of 2.8 g at 0 0 C (10 mmol) NPPh and 3.8 g (30 mmol) of N, N-dimethylcyclohexylamine in 70 ml CH 2 CI 2 were added. The reaction mixture was stirred for 14 h at room temperature and heated for 6 h at 40 0 C. Subsequently, 200 ml of methanol was added and the precipitated yellowish-white solid was filtered off. For purification, the suspension of the suspended solid in 50 ml of methanol was stirred for 12 h. After filtration and drying there was obtained 6.4 g (75% of theory) of the desired compound 4 as a white solid. The phase behavior of the inventive compounds during heating and cooling is shown in the following Table C1. carried the designation of the phases according to the commonly used notation (see this example, Pure Appl Chem 2001, 73, 845-895;... Ullmann's Encyclopedia of Industrial Chemistry, Sixth Edition, 2000 Electronic Release, Chap 3.1 "Thermotropic Liquid Crystal Polymor-phism ";.. Angew Chem 2004, i | 6, 6340-6368). To denote the crystalline phase "K" is selected, "poly" indicates that polymerisation takes place or has taken place. denotes ".DELTA.n" the anisotropy of refractive index of the respective nematic compound. The .DELTA.n values were, unless otherwise noted, at 20 0 C by conventional methods (eg ST Tang, HS Kwok, J. App. Phys. 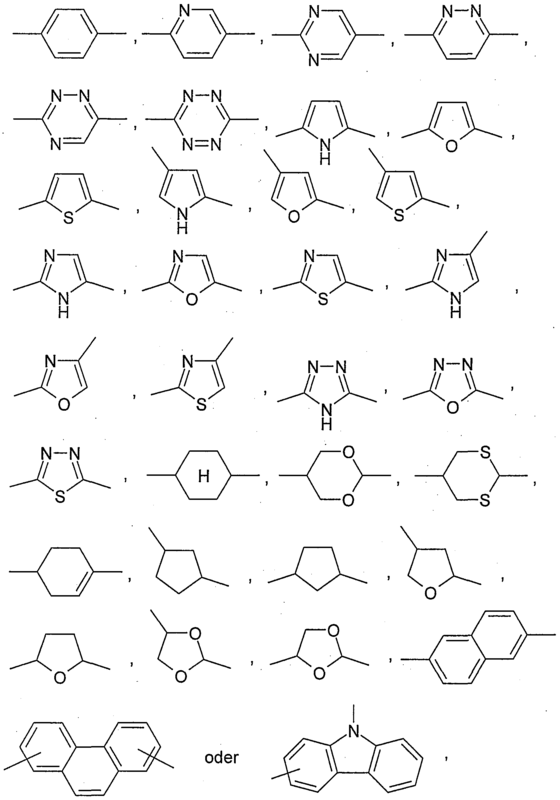 2003, 89, 1, 80 ff and G. PeIzI determined in the "Handbook of Liquid Crystals. "VoI 2A, Chap. 2.4" Optical Properties of nematic Liquid Crystals ", 128-141, 1998, Eds D. Demus, JW Gooby, GW Gray, HW Spiess, V. VIII 1 Wiley-VCH and the fact cited publications). obtained with 94 mol% of the corresponding, characterized in Table C1 connection. 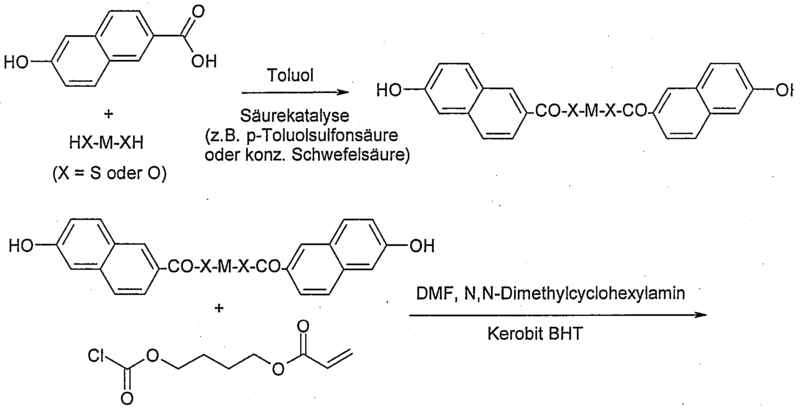 Solutions of these compounds or compositions (as a solvent of these solvents in question as methyl ethyl ketone, tetrahydrofuran or toluene and mixtures) to polyethylene terephthalate (PET) - or triacetyl cellulose (TAC) - Substrate - is here mostly film and subsequent UV curing receive. For exact procedure with regard to the production of such films is, for example, refer to the document WO 99/11733 A1. 2. Compounds according to claim 1, in which r assumes the value 0.
wherein in the radicals L 1 and / or L 2 serstoffatome bound to carbon atoms of water may be partially or fully substituted by halogen atoms. 5. Compounds according to one or more of claims 1 to 4, in which Y 5 corresponds to a group -O-COO-. 6. 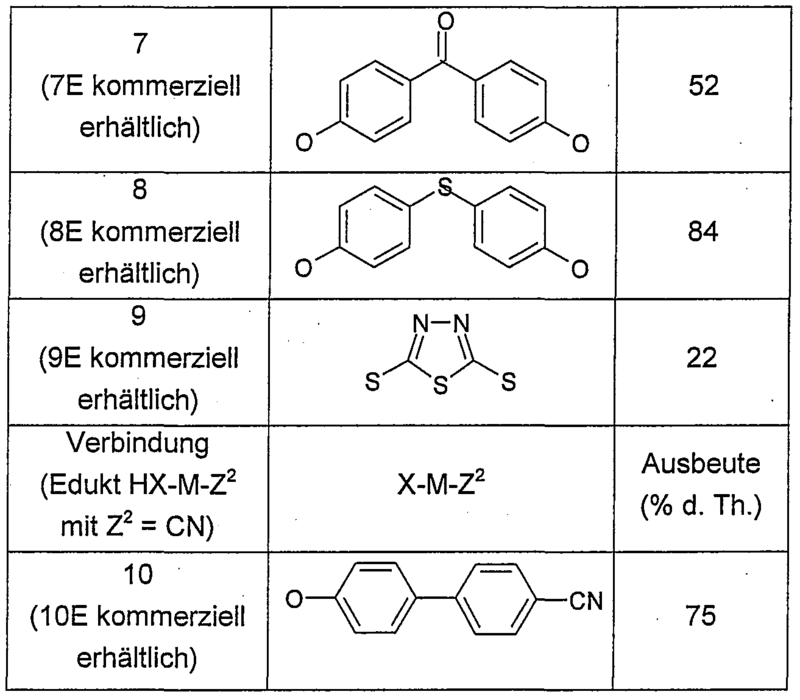 Compounds according to one or more of claims 1 to 5, in which the 10 groups Z 1 -Y 1 -A 1 - and -A 2 -Y 2 -Z 2 are the same. 11. A polymerizable or nonpolymerizable liquid-crystalline composition of comprising as components 10 to 100 wt .-% of compounds according to claims 1 to 10, 0 to 90 wt .-% further monomers, 0 to 50 wt .-% of one or more chiral compounds and 0 to 90 wt .-% further additives, the sum of the proportions of the components adding up to 100 wt .-%. 13. A process for printing or coating a substrate, characterized marked characterized in that applying a polymerizable liquid crystalline composition according to claim 11 to the substrate and subsequently polymerized. 14. 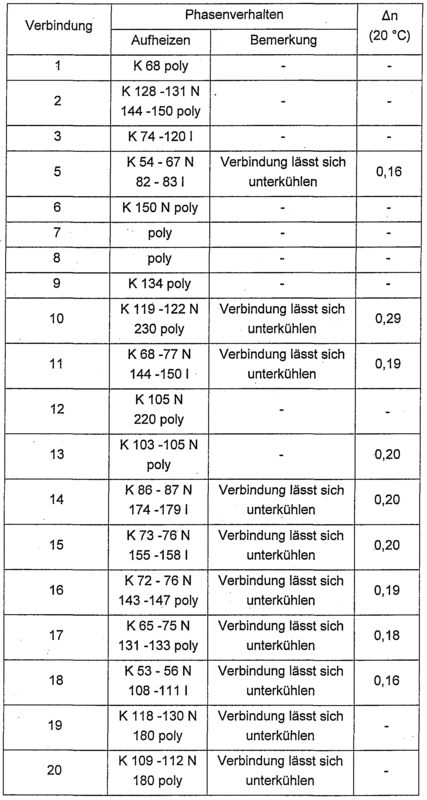 Use of a liquid crystalline composition according to claim 11 or an oligomer or polymer according to claim 12 for the manufacture of optical or electro-optical components shear. optionally 'converts, wherein W and W' in the presence of one or more auxiliary compounds, to unsymmetrical compound of formula Ib for the same or different from each other, leaving in the reaction leaving groups or identical or different precursor groups STE hen which the or the optionally present auxiliary compounds can be converted into a leaving leaving group. , where Z 1, Y 1 and A 1 has the same meaning as in the preceding claims have defined. 17. Use of a liquid crystalline composition of the invention according to claim 11 or of oligomers or polymers according to claim 12 for producing a heat-insulating coating comprising one or more cholesteric layers which, in the infrared wavelength region, preferably above 750 nm, in particular in the wavelength range of 751 nm to about 2000 nm at least 40%, especially at least 45% of the incident radiation is reflected. having wavelength range of about 390 nm to 750 nm has a transmission of at least 80%, especially at least 90% of the incident radiation. 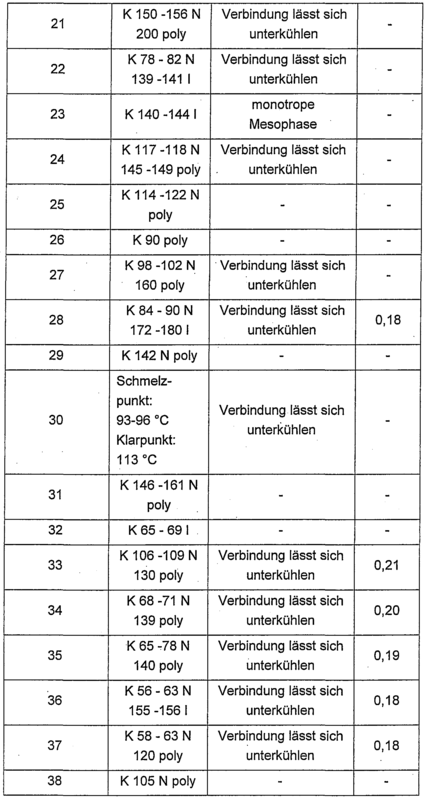 DE4240041A1 (en) * 1992-11-28 1994-06-01 Hoechst Ag New naphthalene cpds used in ferroelectric liquid crystal mixt - esp for switch or display, which induce or extend nematic phase and reduce or reverse tilt angle with falling temp. DE3888757D1 (en) * 1987-08-25 1994-05-05 Hoffmann La Roche Optically active liquid components. US6139771A (en) 2000-10-31 Mesogenic materials with anomalous birefringence dispersion and high second order susceptibility (X.sup. (2)).